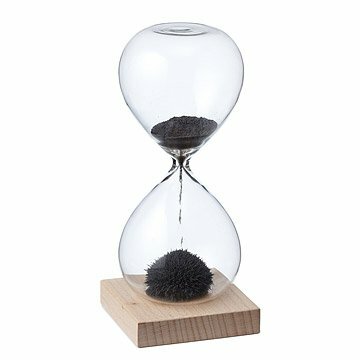 Add a meditative element to your desk with the stalagmite-inspired magnets in this hourglass. This unique hourglass puts a scientific spin on the sands of time. A magnet in the wood base interacts with the ferrous sand to produce mesmerizing, temporary stalagmites in the lower chamber of the glass. The natural timer magnetically marks one minute and makes a great gift for gadget-loving co-workers, dads, teachers, or your own desktop. Made in China. I bought this for my manager to sit on his office desk, and he loved it. It's small enough to not be distracting, and it's elegant and interesting to look at. 10/10 would recommend. This was a farewell gift for a coworker. It is a fun way to give someone a minute of your time. I purchased this for a very, very hard to buy for teenage boy who complains about most gifts. When I asked what his favorite gift was, it was this hourglass. Unfortunately, it cracked immediately or may have been cracked when I bought? I didn't open it and probably should have. Now the shavings fell out and is no longer usable. I can't fault the company because it could have cracked during delivery, but the glass is very fragile either way. A unique gift for sure . This is a cool gift. Could use a stronger magnet. Great office white elephant gift! This was purchased for our office holiday white elephant gift exchange. People liked that it was both fun and useful. This was a gift for my husband. Being a Patent Attorney, he likes to display different & interesting "scientific" type items on his desk. This was a great additon to his collection. It also helps him to remind him to stop and take a break once in awhile. Not too sure if I would but it again. It's reaaly for adults not young people. I bought this for work time/breaks for computer work which is supposed to help w productivity. Love the item, wish it were and HOUR not a minute glass. Returned since although a fun concept, more of a toy or science concept demo item. Thought it would be a nice alternative to a timer on a cell phone. I could go on and on about the great, unique gift ideas and priced in every range.